From having multiple paint colours that don’t blend with one another to actually using the wrong design, there are lots of decorating mistakes that you can learn from. 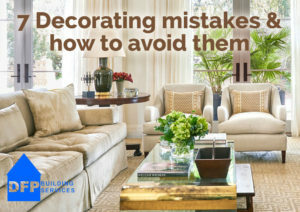 That’s why we created a quick list to help you see some of the major decorating mistakes you may encounter and how you can avoid them the best possible way. Test colours the best way you can. You need to test the samples on a wall and leave them there for 1-2 days. It’s not a good idea to just put the paint there and come back in an hour to see the result. Proper testing is required. Otherwise you could end up not choosing the right colour. Aside from choosing the right paint colours, you need to make sure that you decorate everything based on your lifestyle and select suitable furniture and fittings. This plays a very important part in your life. Do you need durable furniture or maybe you just want a few pieces of inexpensive furniture? These things matter a lot and can make a lot of difference, so choose wisely! People will view your hallway first, and first impressions count. So you want to make it welcoming and inviting by bringing together the right colours, textures, fixtures and fittings. It’s all about making sure that you treat it just like any other room. You want your guests to have a great flow as they go from one room to the next. Using similar colours and styles can pay off here. Of course, you should also try to make the change as genuine and as distinct as possible. You can choose overhead lighting, accent lights, table lights, wall fixed lights or natural lighting. The idea is that you want to create a mood with these lights, so you will have to figure out which one of them offers the perfect ambient and mood in this regard. It’s not going to be a walk in the park, but it’s indeed offering you a very creative and distinct way to handle all these things. Pillows are great if you want to spruce things up. But they can also end up being way too many at times. Add too many pillows, and you won’t have enough place to sleep in. So, try to avoid using way too many pillows. Opt for a style or anything that makes sense for you. Don’t overload a room with pillows, as it doesn’t make sense and it won’t look amazing either. Artwork pieces have to be placed at eye level. You want to see them properly without having to move your eyes up and down. It just makes a lot of sense to use this approach, and it’s well worth the effort. Are you more focused on visuals, or do you want the furniture to be stylish? It all comes down to the features you want and what you need from all of this. Remember, comfort doesn’t mean that you have to sacrifice style. A good idea is to combine both to get the best results. It’s safe to say that there are plenty of decorating mistakes you may have to face. But if you take your time and focus on getting the best results, the outcome can be quite astonishing. It may not be easy for you to find the right way to decorate your home. But it’s always going to pay off if you step away from all the decorating mistakes you can do. Remember, quality matters a lot, and there’s no room for error if you want to decorate your home properly!